In math ascending order or descending order kids will learn to arrange the numbers from bigger to smaller number and also from smaller to bigger number. When the numbers are arranged from the smallest to the largest number, those numbers are said to be in an ascending order. 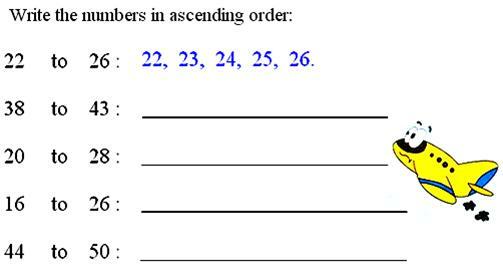 Arrange the numbers in ascending order from 5 to 11. When the numbers are arranged from the largest to the smallest number, those numbers are said to be in descending order. 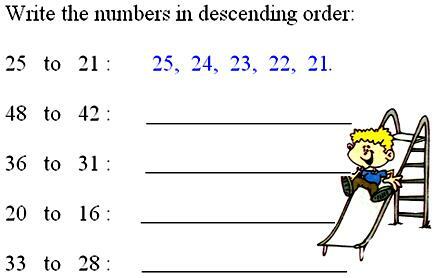 Arrange the numbers in descending order from 23 to 17. Parent and teachers are requested to take the print-out of this worksheet on ascending order or descending order so that children can practice arranging the numbers. Before practicing this worksheet kids need to read the above lines, understand and then quickly grab a pencil to enjoy arranging the numbers. If the children is a visual learner they can also follow the direction of the colorful picture to understand it in math logical way.